Hola guys! I know I’ve been pretty bad this week in terms of posting – but there’s been a bug going around uni and work, and I’m one of the unfortunately few to have caught it. Bummer! Not to worry though, it hasn’t been too bad. Being sick has its advantages though, and it’s being able to stay at home and watch youtube (and read heh)! And there’s been some GREAT trailers out this week for the YA book world. Eeeeep! I am extremely excited about this movie, having loved the series immensely. Read my 4 out of 5 stars review for The Maze Runner HERE. The casting for the movie is great, and I love Kaya Scodelario in basically anything she does (Skins anyone?). And the maze … lost for words! Wowowow, it’s crazier than I expected it to be. There’s a few nit-picky things I don’t like, like how Theresa seems to be awake and talking to Thomas – but that’s ok! Will be good to see how they adapt the story onto film. Anyone else waiting eagerly for this movie? Trailer was borrowed from the Hypable website. Whoaaaa! I’ve been waiting patiently for the release of this book – and it’s finally here! Woke up this morning to an amazing package on my doorstep AND to the release of this trailer. To be honest, the premise of the novel sounds a lot like Matched by Allie Condie, but I didn’t enjoy that book at all so I’m hoping this one blows my expectations out the door. Plus, the cover is super shiny, and I’m attracted to shiny things. 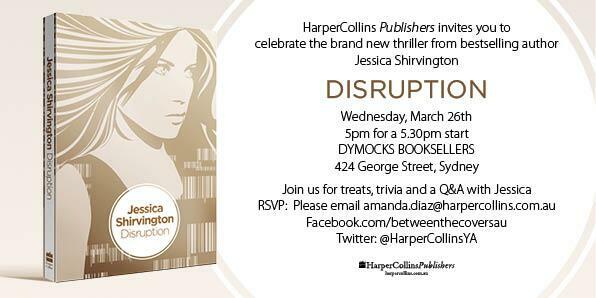 To all my fellow Sydney-siders, there’s an event being held to launch Disruption next week at the George St Dymocks. Happy Hump Day everyone, hope you’re having a brilliant week so far.